There is nothing more ubiquitous when mentioning "real" hip-hop to some people than that phrase and The Roots. The hip-hop group/band has been almost single handedly it seems, keeping the idea of live music and rap alive for getting on a quarter of a century now. The Philadelphia group even has become the house band for Jimmy Fallon's late night show. Of all hip-hop cult followings, theirs is probably the largest. 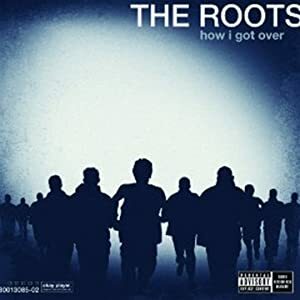 "How I Got Over" marks the third album on Defjam which was supposed to catapault them into the stratosphere of success because it seems some people still don't know who they are though they have hit every continent except Antartica. Is followed by a J. Dilla piece for an interlude as is required from all soul hip-hop artists now apparently. "The Day" is a subdued song that allows the artists on the track, Blu, Phonte, and Patty Crash on the hook, to paint pictures of life. "Right On" features STS as the guest emcee, but his verse is a letdown compared to the consistency shown elsewhere. Black has his own with no features on "Doin it Again" where he espouses about the bands ability to continue their legacy over and over. John Legend lends vocals on "The Fire" which is about the desire to continue and keep moving with inspired music. "Web 20/20" features Truck North and Peedi Peedi but leaves room for improvement. Honestly, I am a Roots fan but this is the first album where I have ever felt that the music overshadows the lyrics completely. There are too many guest appearances and too much of the same feel throughout the album, and when someone is brought in to shake things up like a Truck North, they just aren't good enough to pull it off. Listening to this I feel a little empty like the messages the group is trying to put forth aren't being sunk in deep enough to have an emotional impact.